Here are some observations about the risk map shown in Example 4 (and shown below). The vertical axis represents the significance of a risk. For instance, if you are allergic to bee stings, then you would rank the significance of a bee sting highly, such as 0.9 or 1.0. If you are not allergic to bee stings, then you might rank the significance as a 0.1. Be sure you understand that the vertical axis displays rankings, not probabilities, where 1 is "most significant" and 0 is "least significant." The horizontal axis represents a risk's likelihood of occurrence. 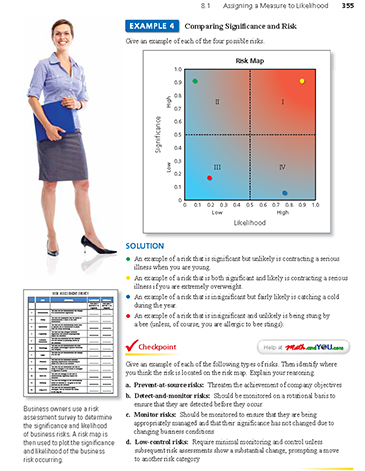 The risk map is divided into four quadrants, labeled I, II, III, and IV. Risks in Quadrant I are called primary risks because they are likely to occur and are significant in consequence. Risks in Quadrant II are significant in consequence. However, these risks are less likely to occur than those in Quadrant I. So, the risks in Quadrant II are second in priority after the primary risks. Risks in Quadrant III are unlikely to occur and are less significant. In general, these risks have the least priority compared to the others. 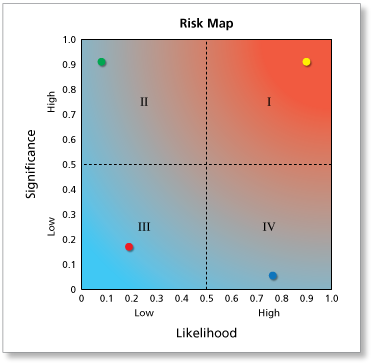 Risks in Quadrant IV are less significant than those in Quadrants I and II. However, the risks in Quadrant IV are more likely to occur than those in Quadrants II and III. So, these risks have a higher priority than those in Quadrant III. The likelihood of catching a cold, especially during the winter, is hard to avoid. However, there are still many things you can do to assist in preventing the nasty virus. Visit WebMD for 11 Natural Tips to Prevent a Cold. Examples of prevent-at-source risks are a company's sales decreasing or its stock price falling. These are likely because sales and stock prices can change every day. They are significant because if sales decrease enough, the company may not have enough money to pay its operating expenses and if stock prices fall, investors may stop investing in the company. These events fall in quadrant I: high likelihood, high significance. Examples of detect-and-monitor risks are a company's server crashing or building burning down. These events are unlikely because there are usually many safeguards in place to prevent them. They are very significant because they would prevent the company from doing its day-to-day work. These events fall in quadrant II: low likelihood, high significance. An example of a monitor risk is employees missing work due to sickness and vacation. This is likely because people miss work almost everyday. It has low significance because most companies are designed to run smoothly even when some employees are missing. Employees missing work should be monitored because if too many missed work all at once, it could cause a problem. This falls in quadrant IV: high likelihood, low significance. An example of a low-control risk is running out of pens or a similar office supply. This is unlikely because there are always extra pens lying around at most companies. It is insignificant because more pens could be quickly purchased at a supply store. This falls in quadrant III: low likelihood, low significance. The type of analysis shown in Example 4 is interesting to me. How many times have you seen people or companies spend a lot of energy, time, and money addressing a problem that is both insignificant and unlikely? I remember an e-mail in our company a few years ago telling employees that it was against company policy to go barefoot in the building. It bewildered me ... partly because I thought that it was both insignificant and unlikely.